When my first child started to crawl, a friend gave me a used pair of Robeez shoes/slippers. 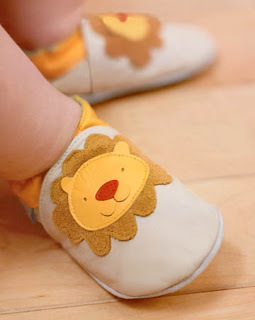 I quickly fell in love with these natural, leather shoes for babies. I wanted my child to be able to keep her socks on during the cold winter months, but I didn’t want her in hard sole shoes. I believe that growing feet should be allowed to grow naturally, not conforming to a shoemaker’s idea about how the foot should be structured. Robeez allow your child’s foot to grow naturally, as if the child was barefoot (which is what I advocate in warm months). Without Robeez, my daughter’s socks would not stay on. I tried other leather and wool booties, but they would also fall off her feet. Robeez solved the problem, and both of my kids wore them well into toddlerhood. Here’s the story behind Robeez, “Sandra set out to handcraft a pair of brightly colored, soft-soled leather shoes for young Robert. She was pleased to discover that the shoes seemed to improve his balance, because the soft soles allowed him to “feel” the floor while he toddled about. Sandra decided to name the shoes after her son. “Robeez” shoes were born.” Robeez now offers gift collections and clothing to match their cute booties!